FRIDAY, Sept. 15, 2017 (HealthDay News) -- Golf carts aren't just for golfers anymore, and their widening use means injuries for kids who want to give the vehicles a whirl, new research shows. Researchers looked at more than 100 children ages 17 or younger treated at pediatric or adult trauma centers in Pennsylvania after being injured in a golf cart from early 2004 to late 2014. The injuries weren't always mild. Three-quarters experienced at least one bone fracture; more than 4 in 10 suffered a skull fracture; and more than a third required admission to an intensive care unit (ICU), the study showed. Such data "made us aware that golf carts were causing significant injuries in children within our state," said study co-author Dr. Mariano Garay. However, golf carts "are not given as much attention as other recreational vehicles," said Garay, currently a resident physician at Allegheny Health Network who was a medical student at Penn State College of Medicine when he worked on the study. "The idea for the study originated while conducting a project on ATV [all-terrain vehicle] injuries in children," Garay said. He and his colleagues found that "over the 11-year period we studied, the number of children who were admitted to a trauma center in Pennsylvania, due to golf cart-related injuries, remained relatively constant," he said. "[But] we also found that the significance of the injuries were comparable to those sustained by ATV riders," Garay noted. "Which was surprising since golf carts, in general, cannot achieve the speeds of ATVs." He pointed out that in Pennsylvania golf carts are exempt from registration requirements, though they are not supposed to be driven over public roads except when used to cross. Prior research has shown that most cart-linked injuries occur on the golf course, but as many as 30 percent now happen on the streets, or at a home or farm. The researchers said they were also unaware of any existing parental or physician guidelines with respect to golf cart use among children. The average age of the injured kids was 11, the study found. Among pediatric golf cart accident victims, older children -- defined as 6 years old and up -- were less likely to suffer a fracture of some sort than children under age 6. However, more than a quarter of the children did suffer a concussion (27 percent). The risk for concussion was found to be higher for children ages 6 to 11, compared with kids under 6. Roughly 25 to 30 percent sustained brain injury and brain bleeding, and one child died. 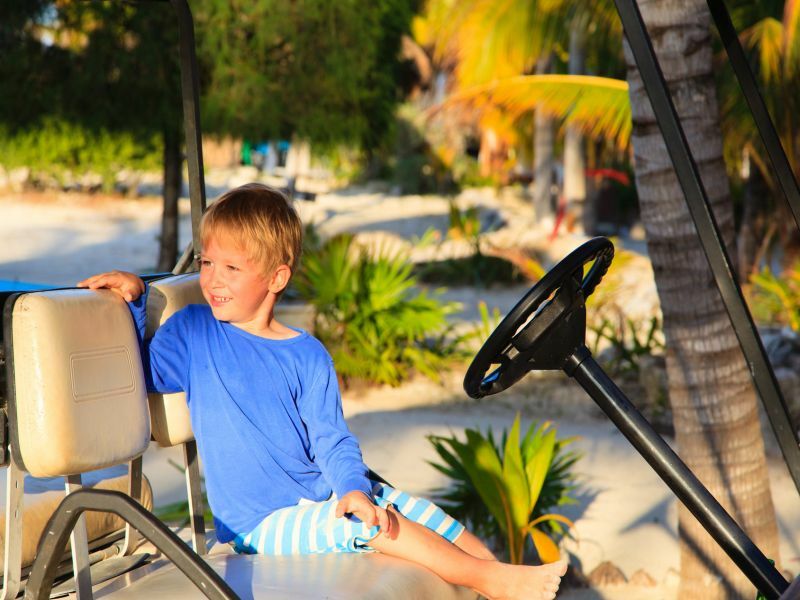 Do parents fully appreciate the potentially serious risk young golf carts users face? Garay said that's just not known right now. "I think it would be interesting to study if parents and users think of them as safer than other vehicles," he said. Still, based on the new findings, the researchers believe that professional medical organizations should take steps to put in place some form of parental guidance with respect to pediatric golf cart use. Dr. Gary Smith is president of the Child Injury Prevention Alliance, and director of the Center for Injury Research and Policy at Nationwide Children's Hospital in Columbus, Ohio. He was not involved with the study. Smith believes the study may paint an overly dire portrait of injury risk, mainly because the study team focused exclusively on trauma center injuries. Those types of injuries, by definition, would exclude less serious injuries that don't require in-patient hospitalization. That said, Smith agreed that "golf carts are not designed for children, and most offer no child safety features." And he cautioned that "whether on uneven off-road terrain or on streets mixed with other vehicle traffic, children under the age of 16 years generally lack the maturity of judgment and impulse control to safely operate these vehicles. "Hopefully," Smith added, "this study will help raise awareness among parents of the dangers of allowing children to operate golf carts." Garay and his colleagues are slated to discuss their findings Monday at a meeting of the American Academy of Pediatrics, in Chicago. Findings presented at meetings are typically viewed as preliminary until they've been published in a peer-reviewed journal.